ONE lady waiting on New Zealand’s 90 Mile Beach wished she had bionic vision yesterday for her own special Shaun Quincey examination. 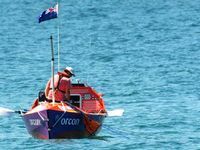 The 25-year-old’s trans-Tasman rower’s mum, Nanette Quincey, was up at 3am waiting for her youngest son to set foot on New Zealand sand after setting off from Coffs Harbour 54 days ago – that’s where her heart had been for the last month and a bit. “I’ve been at sea for weeks and weeks,” Mrs Quincey said. Suited up in togs she anxiously watched pounding waves until just after midday when her son, who’d swum the last 300 metres to shore because of the dangerous conditions finally stood up out of water holding up a Kiwi flag. 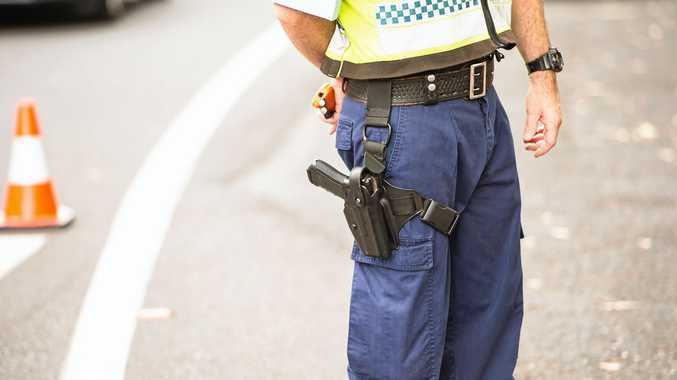 She was the first to reach him and big brother Ben, 28, who’d earlier said he wouldn’t know if he’d strangle or bear hug his sibling, was only metres behind. The Auckland student, who kept up a constant stream of jokes from his Twitter site over the journey, like ‘pretty slow day, saw a whale ... we talked about feelings and then he left’, was swarmed by a crowd of about 500. 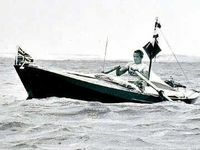 His father, Colin, is the only other person to have successfully rowed solo across the ditch, which he achieved in 1977 although it was in the opposite direction. Mr Quincey (senior) who lives here in Australia is due to arrive in New Zealand tomorrow. 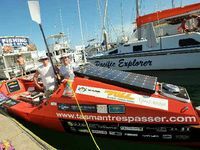 His son’s 7.3 metre Tasman Tresspasser, the home away from home which rolled twice in heavy seas almost derailing the effort, was left to find it’s own way ashore. Asked if he thought a future son would repeat the Tasman effort, Mr Quincey was unequivocal.